Stackable initial and birthstone rings for the grandmother of two. This set comes with two birthstone rings and two initial rings to proudly wear stacked together. 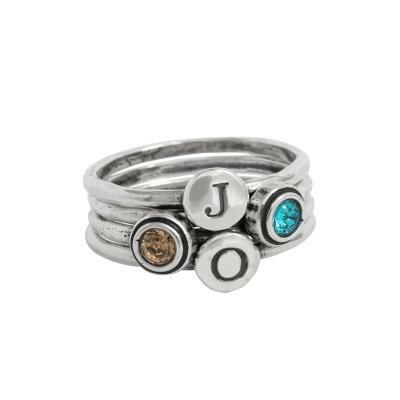 Stackable initial and birthstones ring set for a grandmother of two. This set comes with two initial rings and two birthstone rings. Stack them up and a wear them to represent your two grandkids. This set makes a wonderful present for a grandmother welcoming her second grandchild. So in love with my stackable rings!! Super comfortable, stylish. All of my friends want one now!